Who doesn't love white teeth? 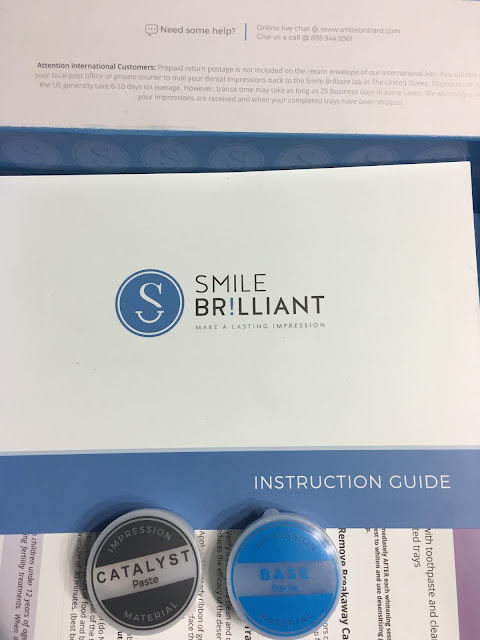 When Smile Brilliant reached out to me to work together I didn't think twice. My mom has always been on my sister and me to brush and floss everyday because she has been in the dental field for over 20 years. I am not a huge coffee drinker, however I do like pop. And being a fashion blogger and taking pictures every week, it is very important to me to have white teeth. So let me tell you about Smile Brilliant. Smile Brilliant is a at home teeth whitening kit that will not only save you time but money. The same whitening system from your dentist can cost over $500! No thanks! Plus you get to do it in the comfort of your own home. 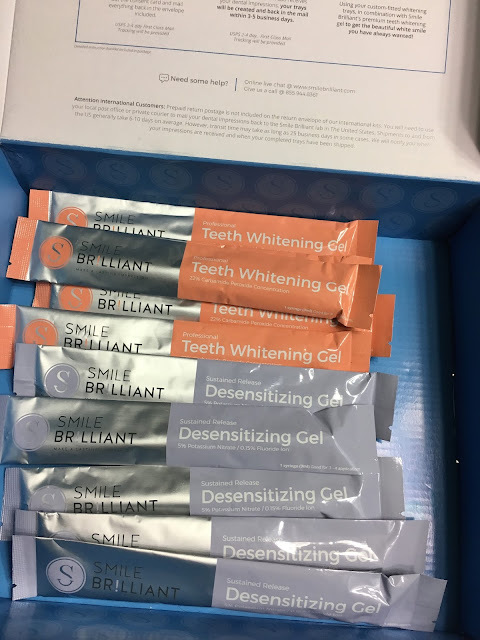 So first, you place your order online at SmileBrilliant.com. Once you receive your kit you will use the two pastes to create your impressions and then mail them back in. They will then send you your clear retainers for you to start your whitening process. I don't know about you but I have tried tons of teeth whitening products and most of them make my hurt my teeth because my teeth are very sensitive. So one thing I really enjoyed was the desensitizing gel. It not only made the whitening process so much easier for me but it prevents re-staining. I used the desensitizing gel for 15 minutes then I whitened them for 30 minutes. However, you can whiten them up to 3 hours at a time. My before and after picture is only after a week. If you want to see more results you can check them out here. Or if you want more information, check out this great video here! I can't wait to keep whitening. Wow!! Look at your smile afterwards �� Your lips look BEAUTIFUL too!!! I would like to try this out myself!! �� Great post Girl! Wow, you can really see a difference. Thanks for sharing! I love Smile Brilliant! Your teeth look amazing girl! Omg wow!! Your teeth look amazing!!! I'm so self conscious of my teeth.. I may need to try these out! WOW! Those results are awesome and it looked so easy! Loving this brand right now. Wow! Look at that amazing difference! GIRL! I am so happy to see these worked so well for you too! You look gorgeous!!! Omg I'm the worst!! It's such a bad habit of mine! Oh wow!!! What a difference that whitening kit made!! Thanks for sharing!!!! Wow they seem to work well!! Can't wait to try mine out!! Hope I get the same results!! Gorgeous girl! You have such a pretty smile. You have great teeth just for starters, but the whitening definetly works!! You look amazing! I need to try this product!! Aw you're so sweet xoxo thanks Ruthie! Wow! I am so impressed with your results! I have been looking for a good whitening treatment so I think this is it! Love it! Omg! It did such an amazing job! I want to try - that's amazing! got to love a good teeth whitener! Your teeth look amazing! I can see the difference - this is an awesome product! Wow that's an amazing difference!! Looks great. Will check it out, definitely. Such a big difference! You have a gorgeous smile!